Reaching out to your favorite place in San Francisco is now much easier. The map of San Francisco, which has been prepared by mapping experts, accurately depicts the airports, roads, highways, hospital educational institutes and places of tourist attraction. Prominently displayed are some of the finest hotels and inns in the city such as Grand Hyatt, Days Inn San Francisco At The Beach and Hyatt Regency San Francisco. On the map you would find San Francisco's famous landmark the Golden Gate Bridge. 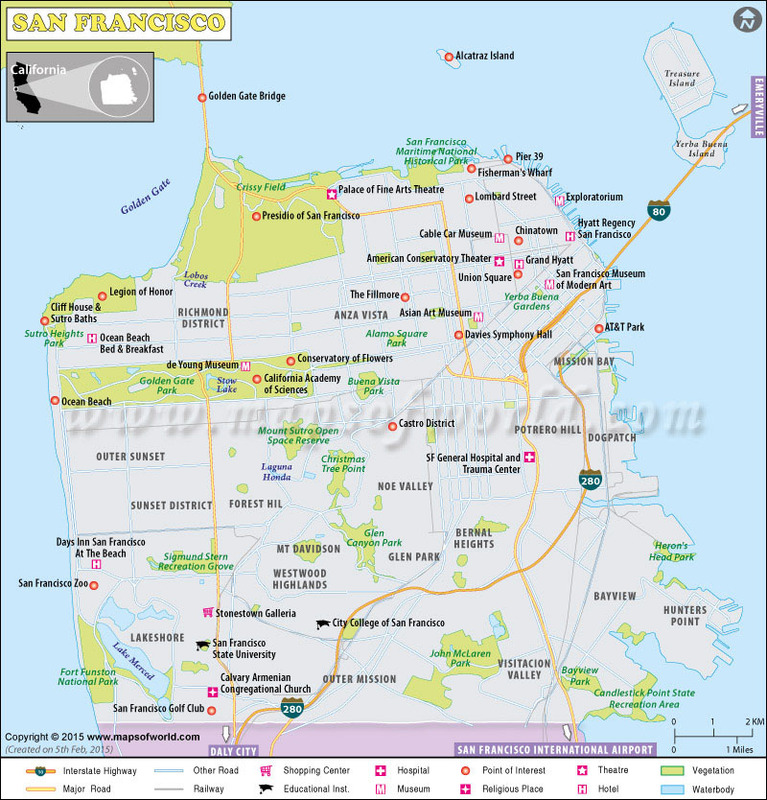 Other prominent attractions and structures that one can easily spot on the map include San Francisco State University, SF General Hospital and Trauma Center, Ocean Beach, Cable Car Museum, Bayview, San Francisco Museum of Modern Art, Richmond District among others. If California seems like a different world, San Francisco - renowned for flamboyant image and anything-goes vibe - is a whole other realm. In 'The City by the Bay', every nook is a novel and every cranny tells a story. It's impossible to forget driving on the Golden Gate Bridge where smoke from Oakland fills the sky and first winking lights of San Francisco appear. The gold and white cosmopolis emerges from the multi-hued Pacific like a medieval painting of a fictional city which never existed, only it does. It's a city of treasure seekers, misfits, vagabonds, 'hair fairies', and 'flower childs'; it's a city that lets no one wait outside its golden doors. It's not just a place to visit and leave, but to linger and live! From the 1849's California Gold Rush to 2010's social media boom, San Francisco has outlived several natural (1906 and 1989 earthquakes) and man-made (1929 Stock Market Crash) catastrophes. From the Summer of Love to the times of Harvey Milk, what happened here was followed by the world. Whether it was the Haight-Ashbury - birthplace of America's counter-culture - (like NYC's Greenwich Village) or the Castro - the cradle of LGBT and liberal activism, the San Francisco Renaissance, fueled by Beat Generation writers, brought monumental changes. Shimmering in the golden sun, the city is located in the San Francisco Bay - the world's largest landlocked harbor - in northern California on the West Coast of the United States. By Air - San Francisco International Airport (SFO), 13 miles south of downtown, is the primary gateway to the Bay Area. Just across the bay, Oakland International Airport is a popular alternative to SFO. By Train - Emeryville is the closest Amtrak train station from the city. It is the western terminus of California Zephyr that starts from Chicago. Trams run on a historic streetcar line from Castro Street to Fisherman's Wharf. By Road - Interstate 80, U.S. Route 101, State Route 1, and State Route 35 are major roads to access the city. SF Muni, a public transit system, operates both rail and bus network. By Sea - The San Francisco Bay Ferry provides services from the Ferry Building and Pier 39 to Oakland, Alameda, and other nearby cities in the Bay Area. Autumn (September through November) has warmer temperature and fewer crowd than summer months and is the best time to visit. Contrary to California's sunshine-and-surfing image, summers in San Francisco are relatively cooler. Cheaper deals on hotels and tours can be availed in winters. Golden Gate Bridge - This orange-colored suspension bridge, that spans majestically across the bay, is the West Coast's reply to the Brooklyn Bridge. Built in 1937, during the Great Depression, this 1.7-mile-long bridge is among the wonders of modern world. Backed by blue waters and shrouded by fog, it links San Francisco with Marin County. San Francisco-Oakland Bay Bridge is another Bay Area bridge and a symbol of San Francisco. Alcatraz Island - They say, "Every window in Alcatraz has a view of San Francisco." Likes of Al Capone and Robert Stroud were kept here in this "escape-proof" prison island. It is home to the oldest lighthouse on the Pacific Coast of the US and rich flora and fauna. Board a ferry - also called Alcatraz Cruises - from Pier 33 to experience the island's beauty, history, and infamy. Its museum, with an audio tour, is a major attraction. Fisherman's Wharf - Dotted with countless seafood restaurants and boutiques, it's an ultimate destination for first-time visitors to stroll around and get a taste of city. After having breakfast at Mama's, blow a kiss to DiCaprio or rub shoulders with Lady Gaga in Madame Tussauds and spend hours playing vintage arcade games in Musee Mecanique. Museums - The De Young Fine Arts Museum - oldest in the city - exhibits American decorative pieces and collection of textiles, costumes, and paintings from Oceania, Africa, and the Americas. The San Francisco Museum of Modern Art (SFMOMA) is devoted exclusively to the artworks from the 20th century, whereas Legion of Honor holds 4,000 years of ancient & European art. Moreover, about 18,000 Asian artifacts and artworks are on display in the Asian Art Museum. California Academy of Sciences - It's an architectural marvel and a science museum that also hosts the Morrison Planetarium (has the world's largest digital dome ) and Steinhart Aquarium (features 40,000 animals from more than 900 species). The Kimball Natural History Museum has interactive exhibits about the evolution and history of earth. Golden Gate Park - Central Park in New York finds its rival in Golden Gate Park. It's an urban oasis of over 1,000 acres that features gardens, museums, a landscaped lake, and several walking trails. The Conservatory of Flowers, San Francisco Botanical Garden, and greenhouses are major highlights. Chinatown - Almost as old as the city, the neighborhood is the largest chinatown outside of Asia. Forget about itineraries and guided tours (Forget it, Jake. It's Chinatown.) and just loiter around its gloriously decorated gate for a cultural and culinary experience that'll open up your senses. Coit Tower - Every city is endowed with a proudly erected emblem: Paris has Eiffel, London has The Shard, Delhi has Qutub, and San Francisco has Coit. The 64-m-tall tower perched on Telegraph Hill offers 360-degree view of cityscape all the way to the scattered islands in the bay. And while taking the stairs down, keep an eye out for the wild parrots. The Presidio, Palace of Fine Arts, San Francisco Zoo and Gardens, Exploratorium, and Ghirardelli Square are other prominent places to visit in San Francisco. Those who are alive, can't get bored here; and those who aren't, the city brings them to life. Catch the beautiful panoramic city vistas from Twin Peaks at dusk, cheer for the 49ers or Giants, ride the cable cars and whiz past city's street graffiti, visit the famous lanes of Bullitt movie car chase, walk past tight turns and fragrant gardens on Lombard Street - the world's crookedest street, or join a guided tour of famous Painted ladies (Victorian mansions). Parks and Recreation - Crissy Field on the northern waterfront offers spectacular view of the Golden Gate Bridge and unparalleled recreational activities including BBQs, picnics, and water sports. Enjoy long walks along its picturesque marshes and catch glimpses of rare flora and avifauna. The Golden Gate Park has miles of biking trails, a golf course, and opportunities for skating, sailing, and windsurfing. Catch a boat and do some island-hopping; Treasure Island, Yerba Buena Island, Red Rock Island, and Angel Island lie within a few-minute ferry ride from the city. To really venture out in the Pacific and take in the salty air, visit Farallon Islands which are roughly 27 miles offshore. Shopping and Dining - From trinkets and t-shirts to pottery and knock-offs, you name it, Chinatown has it; so use your credit card wisely. The upscale stores at Union Square and hip boutiques in Hayes Valley are sought-after haunts among shoppers. The culinary affair with San Francisco starts at PIER 39. It's a ground zero to chow down bread bowls and Dungeness crabs accompanied with wines from the Napa Valley. Visit the Ferry Building, watch leaping sea lions, and board a sunset and evening cruise for spectacular views. Nightlife - Although the city is a gay mecca, it has a rather homogenous nightlife. Some streets such as Union Street in Cow Hollow, 24th Street, Valencia Street, Grant Avenue, and Irving Street are dotted with bars and nightclubs. Look beyond the best gay bars in the Castro for unique encounters. Sunday is a drag (yes, literally) at Harry Denton's Starlight Room and Theatre Rhinoceros hosts transgender tragedies. Suit up to catch a ballet or symphony performance at War Memorial Opera House or head to SoMa neighborhood for vibrant music scene. Festivals - When rainbow flags fly in the San Francisco Pride - largest LGBT parade in the world - it gives a feeling as if Rio Carnival, La Tomatina, and Oktoberfest are rolled into one. Other important calender events are: Bay to Breakers, San Francisco International Film Festival, Carnaval San Francisco, North Beach Festival, Folsom Street Fair, Dine About Town, and Dia de los Muertos.